Sunday 31st May 2015 – 12.00noon – Claire Brown. West Midlands Ambulance Service can confirm that it was called to reports of a stabbing in Grove Lane in Handsworth, Birmingham shortly after 3.00am this morning (Sunday). Two ambulances, a paramedic area support officer and medics from the West Midlands Central Accident Resuscitation Emergency (CARE) Team were sent to the scene. A West Midlands Ambulance Service spokeswoman said: “When ambulance staff arrived they found two patients who had sustained multiple serious injuries. One man was in traumatic cardiac arrest and was being given excellent CPR by police officers on scene. “Ambulance staff and medics quickly took over resuscitation attempts and performed advanced life support on the man. Sadly nothing could be done to save him and he was confirmed dead at the scene. “The condition of the second patient, a man in his 20s, quickly deteriorated and he too went into cardiac arrest. The medical team commenced advanced life support and after several minutes managed to restart the man’s heart. He was quickly transferred to hospital on blue lights. Saturday 30th May 2015 – 8.30pm – Claire Brown. A road traffic collision involving a car and a motorcyclist has left one man dead this afternoon in Warwickshire. The incident happened on the Birmingham Road in Henley-in-Arden shortly before 5.30pm (Saturday). 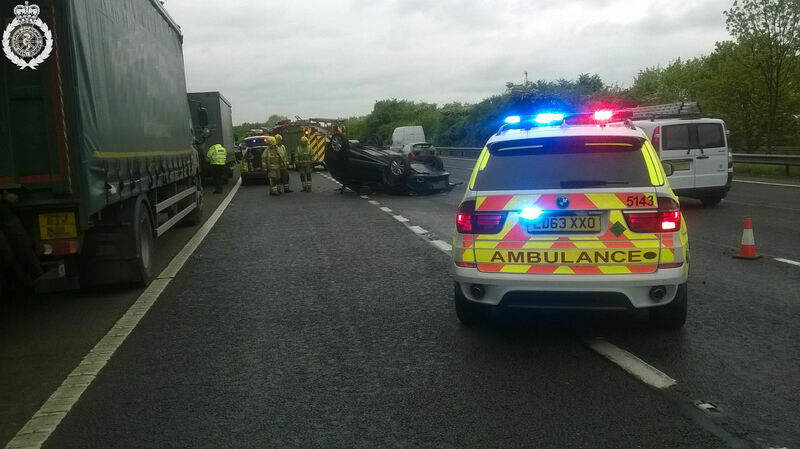 An ambulance, a paramedic area support officer and the Warwickshire and Northamptonshire Air Ambulance with a doctor on board attended the scene. A West Midlands Ambulance Service spokeswoman said: “When emergency services arrived they found a car and a motorcycle which had been involved in a significant collision. The motorcyclist, a man, was in cardiac arrest and passers-by were performing CPR on him. Saturday 30th May 2015 – 6.30pm – Claire Brown. A man in Worcester started his morning on a bike and ended it by being airlifted to a major trauma centre today. 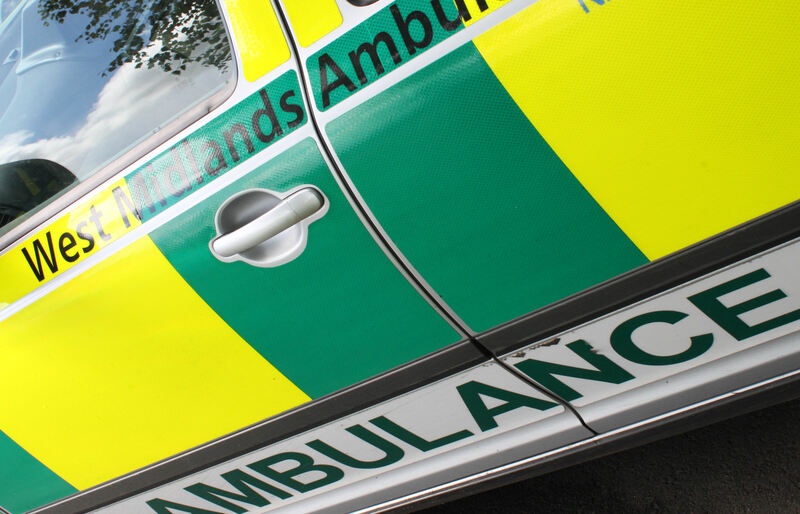 West Midlands Ambulance Service was called to reports of a road traffic collision involving a motorcyclist at the junction of the A422 and B4092 in Inkberrow at around 9.45am earlier today. Two ambulances, the Midlands Air Ambulance from Strensham and two local community first responders were on scene. A West Midlands Ambulance service spokeswoman said: “Crews arrived to find a 69-year-old man who had come off his motorbike. Upon assessment ambulance staff found he had sustained a serious arm injury and a suspected fracture to his leg. He was given pain relief to help stabilise his condition before he was immobilised and his leg splinted to minimise further movement. Friday 29th May 2015 – 6.00pm – Jamie Arrowsmith. A woman has been airlifted and a second was left trapped upside down for 20 minutes following a serious two-car road traffic collision in Rugby this afternoon. West Midlands Ambulance Service was called to the A4071 near Cawston shortly before 3.15pm and sent two ambulances, a paramedic area support officer, a community paramedic and the Warwickshire and Northamptonshire Air Ambulance to the scene. The Warwickshire and Northamptonshire Air Ambulance car, with two critical care paramedics on board, also attended. A West Midlands Ambulance Service spokesman said: “Upon arrival, crews found a car that had come to rest on its roof following a two car collision and discovered two women inside. “Ambulance staff worked with the fire service to release them from the wreckage. “One of the women, the passenger thought to be in her 40s, was suffering from a reduced level of consciousness and crews quickly began treating her for a head injury. She was anaesthetised in order to stabilise her condition and immobilised before being airlifted to University Hospital Coventry and Warwickshire for further treatment. “The driver, also believed to be in her 40s, was unconscious upon the arrival of crews and was trapped upside down for 20 minutes. After regaining consciousness she was treated for a head injury, immobilised and had pain relief administered before being taken to the same hospital by land ambulance. Friday 29th May 2015 – 7.00am – Claire Brown. 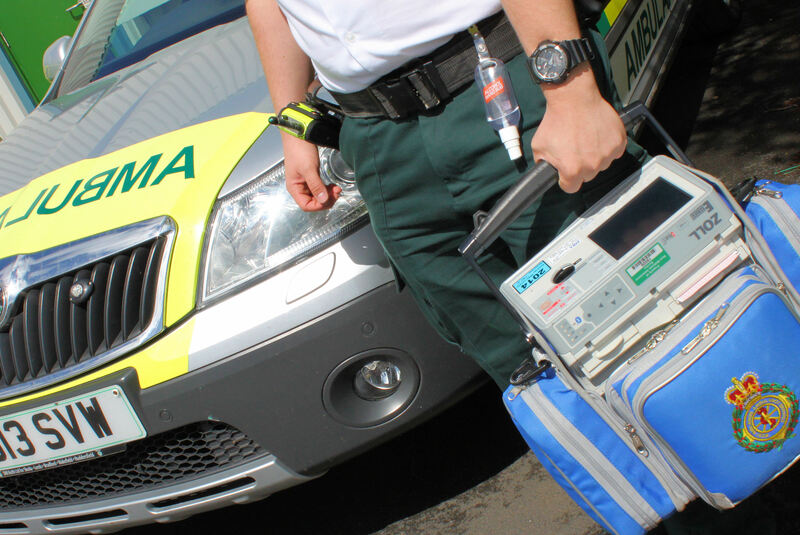 Despite the fantastic resuscitation efforts of passers-by and emergency services, a man sadly died after suffering a cardiac arrest whilst driving in Birmingham last night. West Midlands Ambulance Service was called to reports of a road traffic collision in Belgrave Road near to Birmingham Central Mosque in Highgate just after 9.00pm (Thursday). An ambulance, a paramedic area support officer, a community paramedic and a senior paramedic officer attended the scene. A West Midlands Ambulance Service spokeswoman said: “When ambulance staff arrived they found a car which had mounted the pavement. The driver was in cardiac arrest and was already being given excellent CPR by members of the public and police officers. “Ambulance staff took over resuscitation efforts and worked as a team to deliver advanced CPR at the roadside. The man was given five defibrillator shocks to his heart before being transferred on blue lights to City Hospital. Thursday 28th May 2015 – 9.00am – Claire Brown. A family of five ended up requiring emergency treatment by the ambulance service last night after the car they were in ended up in a field following a significant collision in Hereford. West Midlands Ambulance Service was called to the crossroads of the A438 and A4172 in Trumpet, Hereford at 10.00pm last night (Wednesday). Three ambulances, a community paramedic, a MERIT trauma doctor and two doctors from Mercia Accident Rescue Service (MARS) attended the scene. A West Midlands Ambulance Service spokeswoman said: “When emergency services arrived they found a badly damaged car in a field which had reportedly been involved in a collision with a second car. “The five occupants of the badly damaged car, a father, mother and three children, were all conscious and breathing. “A 12-year-old girl, who had already got out of the car when emergency services arrived, had bruising to her chest caused by her seatbelt and was complaining of some neck tenderness. She was immobilised with a neck collar and spinal board as a precaution before being taken to Hereford County Hospital. “The drivers’ side had sustained the most damage which meant the driver, a 48-year-old man, was significantly trapped in the wreckage. Upon assessment ambulance staff and the medics found he had sustained a suspected pelvic injury and pain in his chest and needed to be carefully extricated from the vehicle. “The medical team worked to immobilise the man and administer pain relief to keep him comfortable whilst the fire service worked around them to cut the man out of the wreckage. After an hour and 40 minutes, the man was released and was transferred to Queen Elizabeth Hospital Birmingham, a regional trauma centre, for emergency treatment. The MERIT doctor travelled in the back of the ambulance to continue treatment en route. Wednesday 27th May 2015 – 10.30pm – Claire Brown. Two boys and a woman have received life-saving care at the roadside after the car they were in ended up on its roof following a road traffic collision in West Bromwich this evening. West Midlands Ambulance Service received multiple 999 calls to reports of a road traffic collision involving two cars on Hollyhedge Road in West Bromwich shortly after 8.30pm (Wednesday). Four ambulances, a paramedic area support officer, a MERIT trauma doctor and the Midlands Air Ambulance from Tatenhill attended the scene. A West Midlands Ambulance Service spokeswoman said: “One car had ended up on its roof following the collision with another car. One boy, believed to be the rear seat passenger from the overturned car, had been ejected from the vehicle and was in a serious condition. He rapidly deteriorated when ambulance staff arrived and sadly went into cardiac arrest. “The medical team immediately commenced CPR on the boy and, after around 20 minutes of intense advanced life support, they managed to restart the boys’ heart. Ambulance staff quickly transferred him to Birmingham Children’s Hospital by land ambulance whilst vital emergency treatment continued en route. The boy was said to be in a critical condition upon arrival at hospital. “Two other occupants from the overturned car, a woman and a second boy, were trapped in the wreckage. 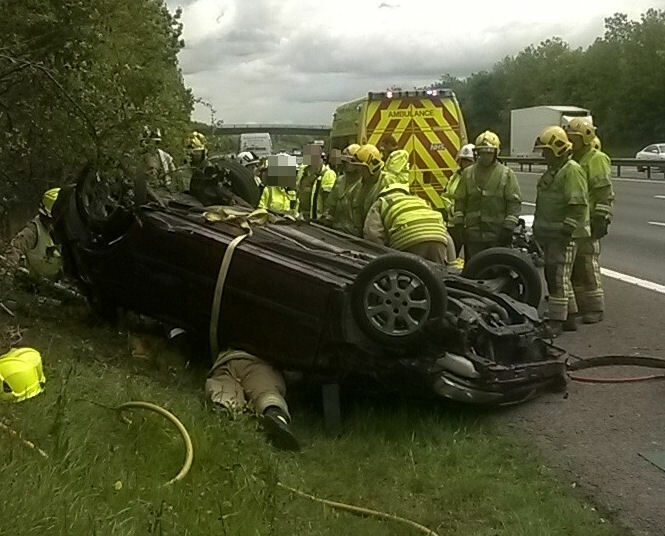 Ambulance staff worked to quickly extricate them with help from West Midlands Fire Service. 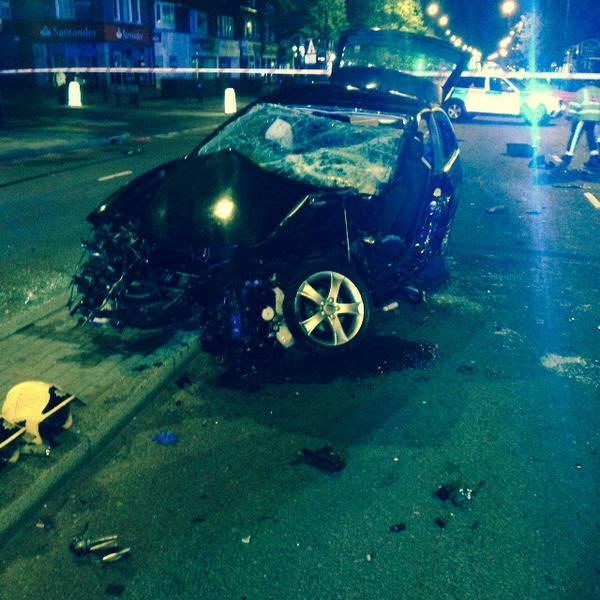 The driver, a woman in her 40s, sustained a serious head injury and suspected pelvic injuries. She was fully immobilised and stabilised on scene before being taken by land ambulance to Queen Elizabeth Hospital Birmingham, a regional trauma centre, for further emergency care. “The second boy, believed to be 12-years-old and the front seat passenger, sustained serious lower limb injuries and abdominal pain. He was given advanced pain relief to help stabilise his condition before ambulance staff worked to carefully immobilise him to prevent further movement of his injured limbs. The boy was alerted to Birmingham Children’s Hospital; medics in A&E were pre alerted to the arrival of the boy. “The driver of the second car, a man in his 30s, sustained an arm injury and was suffering from the effects of shock. He was taken to Sandwell Hospital as a precaution. Wednesday 27th May 2015 – 7.30pm – Claire Brown. A man has miraculously escaped serious injury after the wall of a house collapsed on-top of the car he was sitting in in Birmingham. West Midlands Ambulance Service was called to Richmond Hill, Oldbury shortly before 5.30pm this evening (Wednesday). An ambulance and paramedics from the Trust’s Hazardous Area Response Team (HART) were sent to the scene. A West Midlands Ambulance Service spokeswoman said: “When ambulance staff arrived they found a badly damaged car covered in bricks parked on a driveway in-between two houses. The second storey outside wall of the neighbouring house had collapsed onto the car whilst a man, in his 60s, was sitting inside. “Emergency services immediately evacuated both houses due to concerns with the structural integrity. “Much to the amazement of ambulance staff, the man who had been in the car was out of the vehicle. Upon assessment he was found to have sustained a minor head injury. Once his wounds were dressed, the man was taken to Sandwell Hospital for further assessment. Wednesday, 27th May 2015 – 3.45pm – Jamie Arrowsmith. 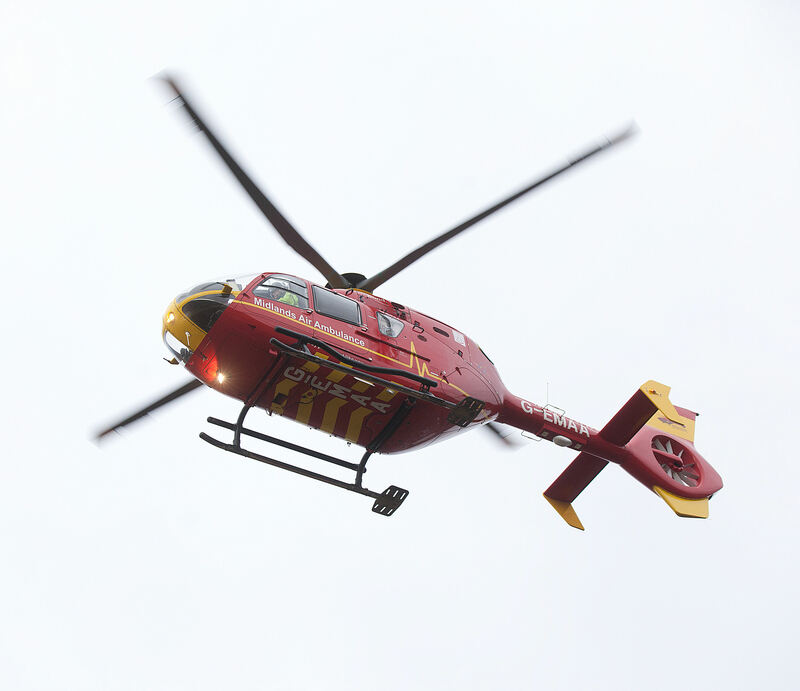 A young boy has been airlifted to Birmingham Children’s Hospital after suffering head, back and shoulder injuries in Tamworth this morning. West Midlands Ambulance Service was called to Pooley Country Park in Polesworth shortly before 11.30am and sent an ambulance, a community paramedic in a rapid response vehicle and the Midlands Air Ambulance from Staffordshire to the scene. A West Midlands Ambulance Service spokesman said: “Crews arrived at the scene to find a nine-year-old boy who had reportedly fallen whilst running down a hill. It is believed he hit his head during the fall, near to a ditch at the bottom of the hill. “The boy was conscious throughout the incident and following assessment he was treated for a cut to his head as well as shoulder, back and neck pain. 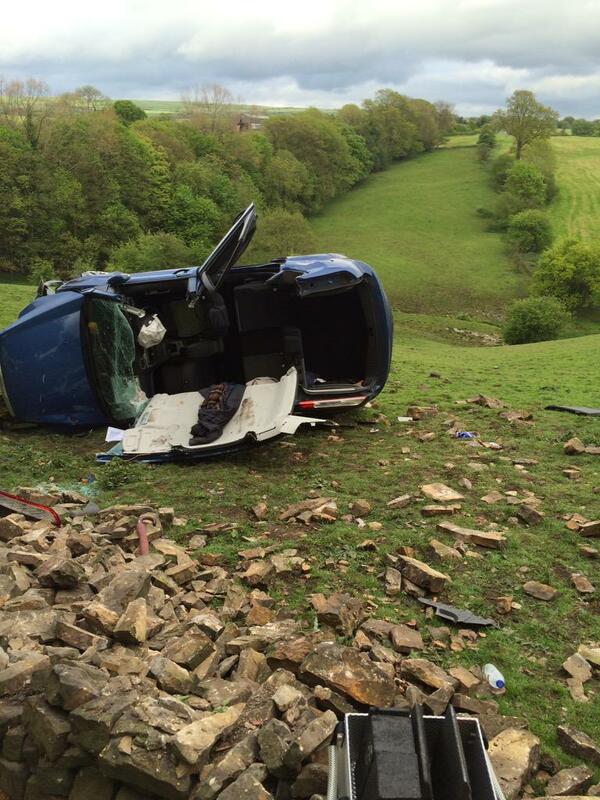 Four people have been ‘exceptionally lucky’ after their car left the road, rolled through a stone wall and came to rest in a field near Leek this afternoon. West Midlands Ambulance Service was called to the A523 Ashbourne Road at just after 4.15pm. Two ambulances, a paramedic support officer and a paramedic in a rapid response car attended the scene. A West Midlands Ambulance Service spokesman said: “Four people were extremely fortunate to escape serious injury after their car left the road and ended up in a field near Leek this afternoon. The car left the road and stopped short of a steep slope where it is likely it would have not been visible from the road. “A woman in her seventies was treated for pelvic, leg and chest injuries. She was trapped in her car for a short time before being released. The casualty was immobilised with the use of a spinal board and orthopaedic stretcher before being taken to the Royal Stoke University Hospital. “A man also travelling in the car suffered a head wound and a further man and woman, believed to be in their sixties were assessed for minor injuries. Monday 25th May 2015 – 5pm – Steve Parry. 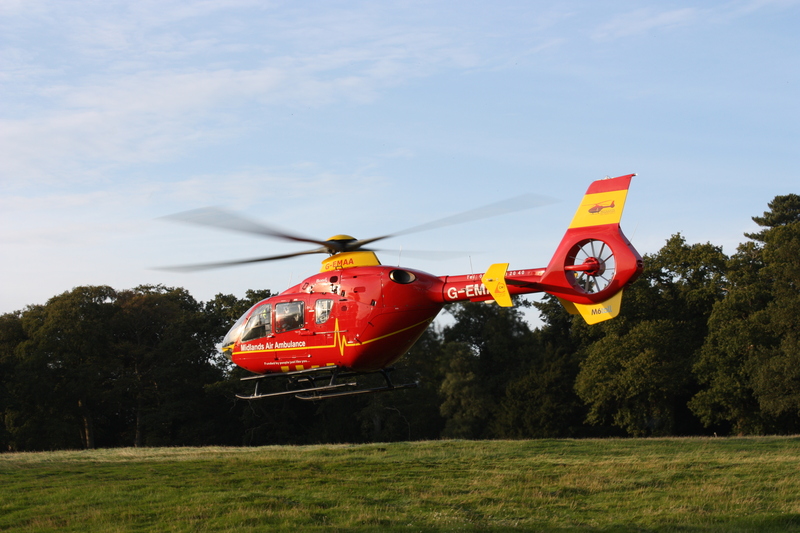 A horse rider has been taken to hospital after falling from her horse near Kinver this morning. The incident occurred at a location near Sugarloaf Lane, Iverley at just before 11.30am. An ambulance together with a community paramedic attended the scene. A West Midlands Ambulance Service spokesman said: “Crews responded to a rider who had fallen from her horse this morning. “The patient, believed to be in her forties, was treated for a leg injury and lower back pain. “She was immobilised with the use of a neck collar and placed on a spinal board as a precaution. “The patient was also given pain relief before being taken by ambulance to Russells Hall Hospital for further assessment and treatment. 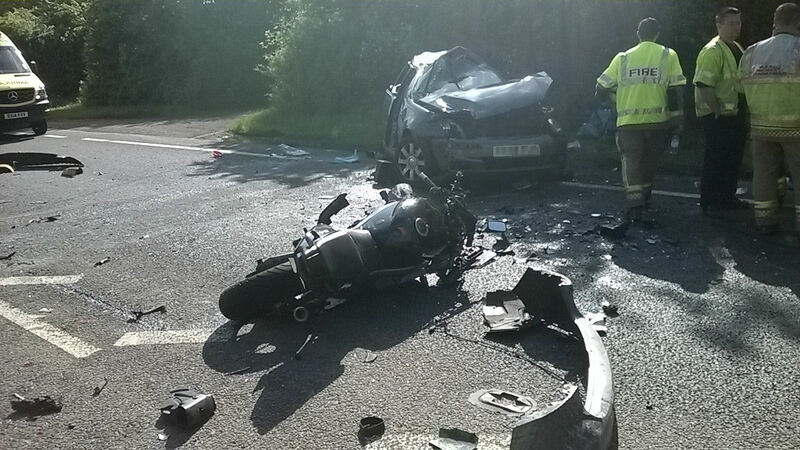 A motorcycle rider and pillion passenger have been taken to hospital after coming off their machine on the Silkin Way near Brookside, Telford. West Midlands Ambulance Service was called to the Silkin Way, just off Aqueduct Road at 10.50pm last night. Two ambulances and the MERIT team, which included a trauma doctor, attended the scene. A West Midlands Ambulance Service spokesman said: “Crews were alerted to a motorcycle incident on a stretch of the Silkin Way at just before 11pm. “It appears the motorcycle collided with a pole on the trackway. “A male rider in his twenties received treatment for chest and facial injuries. He was conveyed by land ambulance to the Royal Stoke University Hospital. Sunday 24th May 2015 – 7pm – Steve Parry. West Midlands Ambulance Service was called to the junction of the A44 and A4110 at Monkland at just before 2.45pm. Two Midlands Air Ambulances and the Welsh Air Ambulance together with three land ambulances and two paramedic support officers in a rapid response cars attended the scene. A West Midlands Ambulance Service spokesman said: “Crews responded to a serious two-car road traffic collision at about 2.45pm. “A woman believed to be in her fifties was treated for back and leg injuries. A man believed to be in his twenties was also treated for pelvic and abdominal injuries. Both patients were taken to Hereford Hospital by land ambulance. 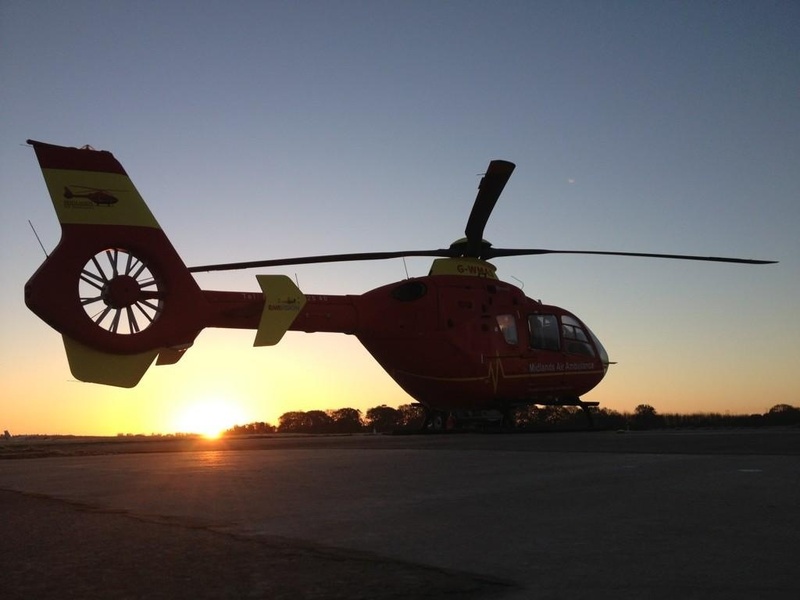 “The Welsh Air Ambulance crew treated a man in his twenties for internal injuries. 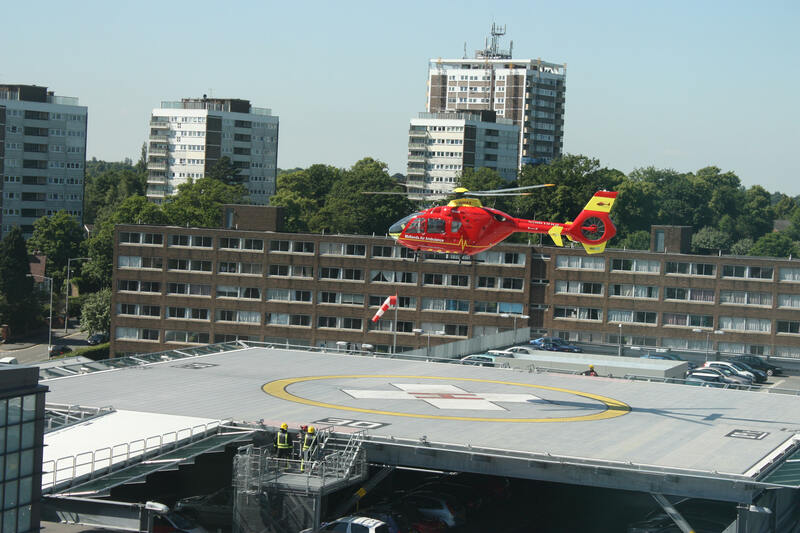 The patient was airlifted to the Queen Elizabeth Hospital for further assessment and treatment. “The Cosford based Midlands Air Ambulance with a MERIT doctor aboard airlifted a man in his twenties who had been trapped in his vehicle. The patient was taken to the Queen Elizabeth trauma centre with chest and spinal injuries. Sunday 24th May 2015 – 6.30pm – Steve Parry. 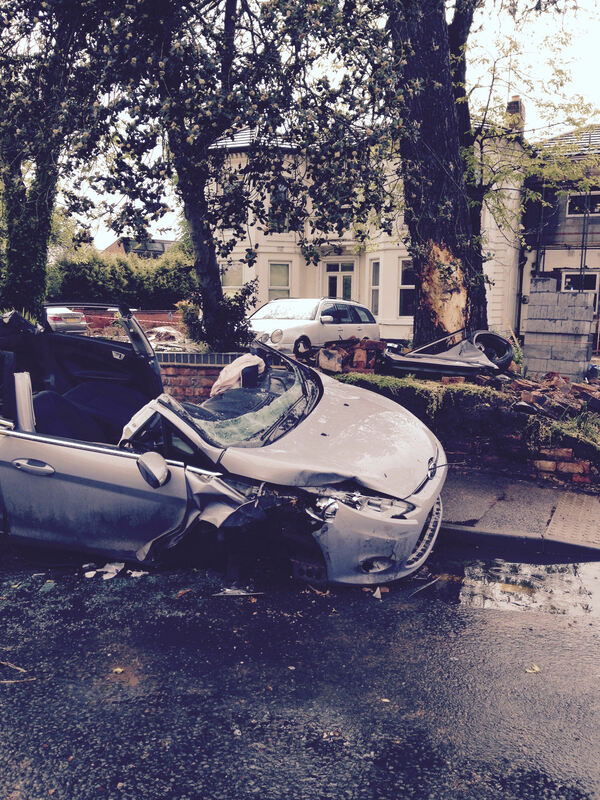 Four patients have been taken to hospital following a road traffic collision in Perry Barr this afternoon. West Midlands Ambulance Service was called to the junction of College Road and Aldridge Road, Perry Barr at just before 4.45pm. Four ambulances together with a paramedic support officer in a rapid response vehicle attended the scene. A West Midlands Ambulance Service spokesman said: “Ambulance crews responded to a road traffic collision involving two cars in Perry Barr this afternoon. “Three people travelling in the second car involved were also treated at the scene by ambulance crews. A woman in her sixties received chest and arm injuries. She was immobilised before being taken to the City Hospital. 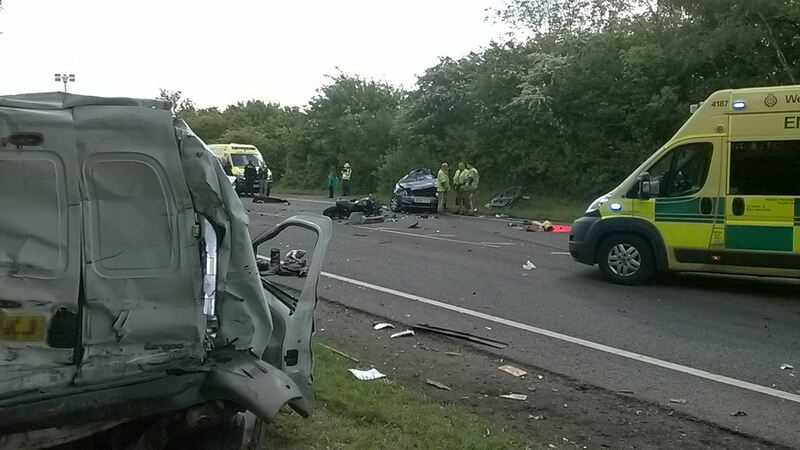 “A man in his fifties and travelling as a front seat passenger received abdominal injuries. He was also conveyed to the City Hospital. Sunday 24th May 2015 – 4pm – Steve Parry. Emergency crews attended a three car collision at Callow Hill near Kidderminster earlier today. West Midlands Ambulance Service was called to Callow Hill at just after 12 noon. Three ambulances together with a paramedic support officer in a rapid response car attended the scene. A West Midlands Ambulance Service spokesman said: “A community first responder came across the three vehicle collision and raised the alarm. .“A woman in her fifties was treated for neck pain. She was immobilised with the use of a neck collar and spinal board before being transferred to hospital. 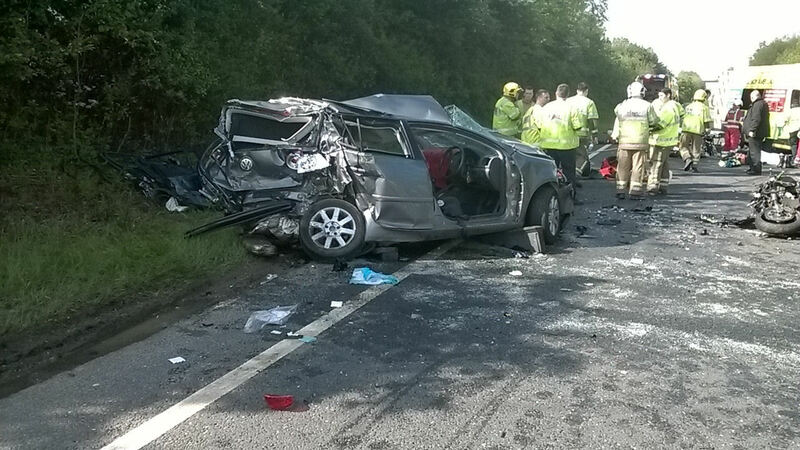 “A family travelling in the second car involved were all conveyed to hospital. A female teenager was treated for pelvic pain and a male and female together with a baby received minor injuries. Saturday 23rd May 2015 – 10.15pm – Jamie Arrowsmith. A man who was standing by the side of his stationary van has suffered numerous serious injuries after a car collided with it near to Southam tonight. West Midlands Ambulance Service was called to Offchurch Road in Offchurch at 8.35pm and sent two ambulances and a paramedic area support officer to the scene. A West Midlands Ambulance Service spokesman said: “Crews arrived to find a male patient who was reportedly standing by the side of his stationary van when a car collided with it, causing the van to hit the man and cause him numerous serious injuries. “The man, believed to be in his 50s, was suffering from a reduced level of consciousness initially but following treatment from ambulance staff this gradually returned to a normal level. “He was assessed and treated for a number of injuries, including a fractured right shoulder, a suspected fractured right arm, a chest injury and suspected abdominal injuries. “He was immobilised with the use of a neck collar and spinal board, given pain relief and also given treatment to stop any internal bleeding. He was then transported to University Hospital Coventry and Warwickshire. The hospital was alerted to the man’s condition prior to his arrival. “A second patient, who was sitting in the van, a woman in her 30s, was treated for cuts to her head and a minor leg injury but did not require hospital treatment. Saturday 23rd May 2015 – 8pm – Jamie Arrowsmith. A motorcyclist has been taken to one of the region’s major trauma centres with a significant chest injury following a collision with a car in Bromsgrove this afternoon. West Midlands Ambulance Service was called to the junction of Kidderminster Road and Perryfields Road at 5.10pm and sent an ambulance and the Midlands Air Ambulance from Strensham to the scene. A West Midlands Ambulance Service spokesman said: “On arrival, crews discovered a male motorcyclist who had come off his bike following a collision with a car. The bike had suffered significant damage in the incident. “Following assessment, the man, believed to be in his 30s, was treated for a serious chest injury and also given assistance with his breathing. He was then taken to Queen Elizabeth Hospital, Birmingham, by land ambulance, for further treatment. Thankfully, his injuries are not thought to be life threatening. “Due to the location of the incident, it was deemed quicker to travel by road than air. Friday 22nd May 2015 – 7.25pm – Jamie Arrowsmith . Two adults and two children have been taken to hospital following a road traffic collision on Himley Lane, Himley this afternoon. West Midlands Ambulance Service was called to the incident at just before 4pm. Four ambulances together with a paramedic area support officer in a rapid response vehicle attended the scene. A West Midlands Ambulance Service spokesman said: “Ambulance crews responded to a road traffic collision involving two cars at Himley, both of which had suffered front end damage. “Prior to the arrival of crews, a group of four student paramedics had already started caring for the patients after coming across the incident. “From the first car, a woman in her 30s was treated for a suspected fractured collarbone and cuts to her stomach. She was given pain relief and immobilised with the use of a neck collar and spinal board before being taken to Russell’s Hall hospital. “Travelling in the back of the car, a nine-year-old boy suffered bruising and friction burns from his seatbelt whilst a five-year-old girl was treated for neck and arm pain. They were also immobilised and taken to Russell’s Hall. We’re bringing TURTLE POWER to Birmingham Pride this weekend! Friday 22nd May 2015 – 12.15pm – Claire Brown. 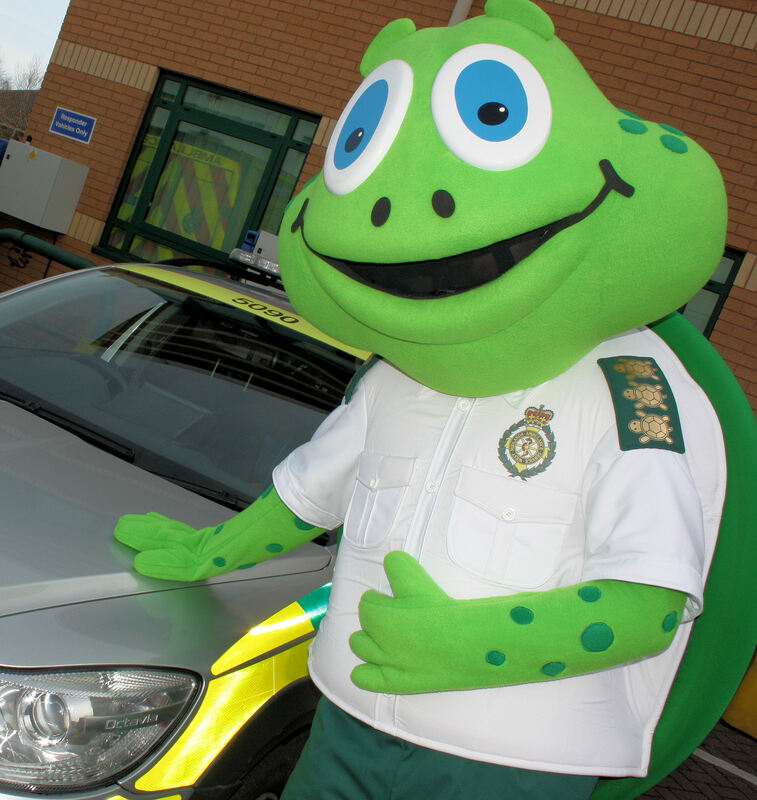 West Midlands Ambulance Service will be flying the flag and bringing along its turtle mascot to celebrate Birmingham Pride this weekend. It will be the second year members of the Trust’s lesbian, gay, bisexual and transgender (LGBT) Network will take part in the parade to support the region’s LGBT communities. 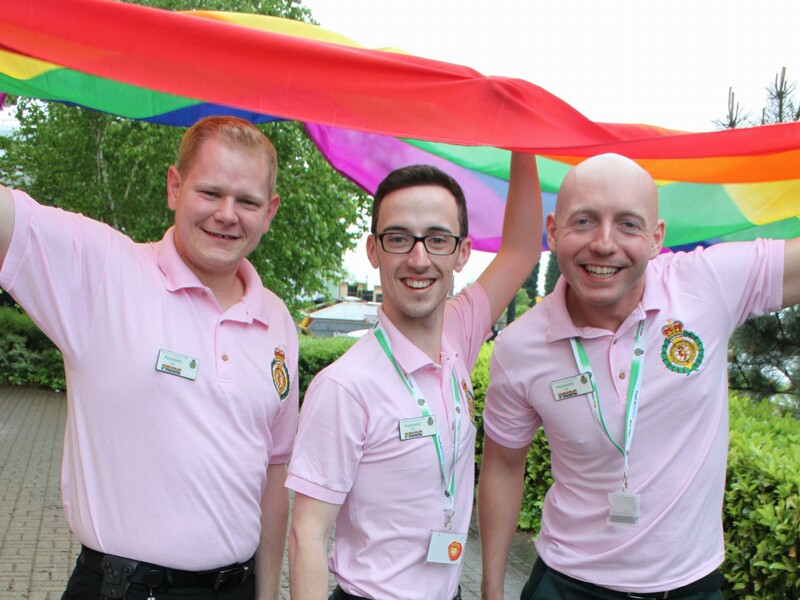 John Renshaw, a Birmingham-based Paramedic Clinical Team Mentor and member of the working group, said: “Last year was the first time the Trust was represented at any Pride event so we’re pleased to be supporting Birmingham Pride once again this year. “Not only will there be members of staff from the Trust’s LGBT Network, we’ve also got a very special guest attending this year. Our mascot, Lloyd the paramedic turtle, will be celebrating throughout the weekend. “We’ll be joining forces again with colleagues from West Midlands Police’s LGBT network and will be sharing a stand. Not only will be handing out freebies and providing useful advice about using 999, we’ll have an ambulance parked up so people can jump on board and explore it. To keep up-to-date with the team’s progress at Pride this weekend, follow @wmasLGBT or @wmaslloyd on Twitter. Don’t forget to use the hashtag #imetlloyd on Twitter if you get to meet our mascot! Photo one – preparing for last years’ Pride (left to right): LGBT Network members Adam Layland, John Renshaw and Adam Aston. Friday 22nd May 2015 – 10.30am – Claire Brown. 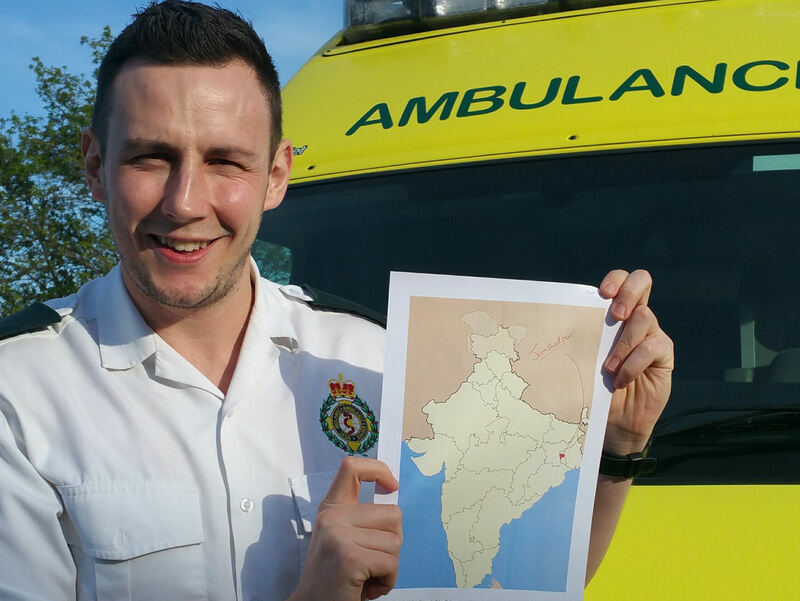 A Birmingham paramedic will be heading to India in September to teach vital life- saving skills to school children. Erdington based Paramedic Sam Grimson, 24 from Birmingham, has worked for the Trust for two years. He will be joining a group of paramedics from other ambulance services to visit some of the most deprived areas of India to teach Basic First Aid skills and CPR in schools. Sam said: “Education like this isn’t provided in India due to a lack of clinical staff and money. With no ambulance service or National Health Service, basic medical treatment in hospitals is expensive and, for some, they simply cannot afford it. “We’ll be teaching children and teachers some of the basics like how to treat burns, minor injuries, deal with choking as well as how to do CPR when someone’s in cardiac arrest. It’s hoped that by teaching youngsters and teachers they’ll then be able to pass on their new skills to their local community. Sam embarks on his journey on Tuesday 29th September with the team’s first destinations planned to be Delhi and then Jamshedpur. You can watch a video of Sam explaining why he’s taking part via https://fundrazr.com/campaigns/3uls1 where you can also donate to support the project. Sam will also be uploading regular updates from India via this website so keep your eyes peeled! Although it is almost a month since a devastating earthquake struck Nepal, the humanitarian work continues 24 hours a day. “On arrival, we established a base of operations in the grounds of the British Embassy, living in tented accommodation. Being experienced in working in post-earthquake areas, the team always prefers tents in open areas which are generally safer than moving straight into un-surveyed buildings with the inevitable aftershocks which follow. 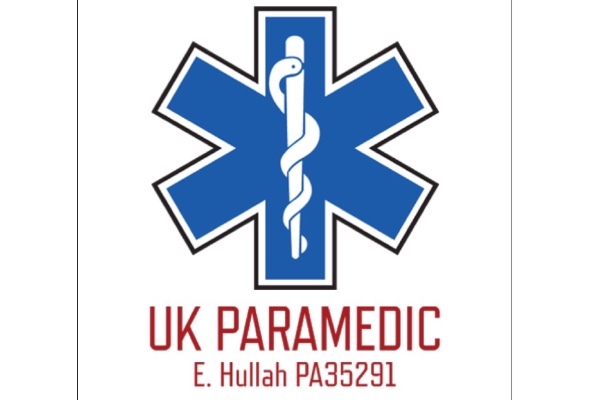 “Our operations began in Kathmandu, with the UK ISAR team being given a specific sector in which to work. The team found that most live rescues had been completed already and that most dead bodies had already been recovered. It soon became apparent that the main area of need was in the more remote mountainous areas which had only been visited briefly by military helicopters, dropping in aid and removing the more serious casualties. Otherwise many of these areas had remain completely isolated and out of touch with very little information coming out about the extent of the damage suffered. “We spent most of the next week, on request of the Nepalese government, re-focussing on an area outlying the town of Chautara about 50km to the north-east of Kathmandu. Whereas Kathmandu had pockets of destruction with many buildings remaining intact, the team found villages in the countryside where 95% of all buildings had been completely flattened. “The scale of destruction was incredible. It was certainly fortunate that the earthquake struck in the daytime on a Saturday, when many people would have been outside, or at least able to run outside quickly. Few were in the larger public buildings and there is no doubt that the death toll would have been far worse in the earthquake had struck at night. Even so, there had been large numbers of dead and injured and it was very saddening to see whole villages completely destroyed. “We initially walked into some very remote areas and later had helicopter flights to gain access to the area. The team gathered information about immediate needs – which were mainly shelter, food and water – provided structural assessment of surviving buildings, gathered important data about remaining village populations, casualty numbers and on-going health needs. This vital information was then fed back to the humanitarian organisations and the Nepalese government. “During our work we found an elderly man with a fractured ankle with open wounds and a woman with a broken arm. Neither had been reached previously by any rescue or medical organisation and this was a week after the earthquake had struck. We were able to get them evacuated to hospital almost immediately. “Working on information provided by local villagers, we also discovered a four year old girl who had been lying on a wooden bed for eight days unable to move, being nursed by her anxious family who did not have access to any medical care. Back in Kathmandu a specialist rope access team of UK ISAR was working to stabilise a precarious piece of concrete hanging dangerously over the main entrance to a teaching hospital. By making the building safe, the hospital was able to increase from 50 hospital beds in use to almost 400 beds overnight, a dramatically positive impact for the local area. Back in the UK, Dr Russell said: “There is still a huge amount of humanitarian work which will have to continue for many months – even years – but it is pleasing to have been able to contribute during the first most difficult days following the earthquake. The 46 year-old was deployed as part of the UK International Search and Rescue (ISAR) team, which included 67 personnel and 4 search dogs, that flew out the day after the earthquake hit. Thursday 21st May 2015 – 5.45pm – Claire Brown. 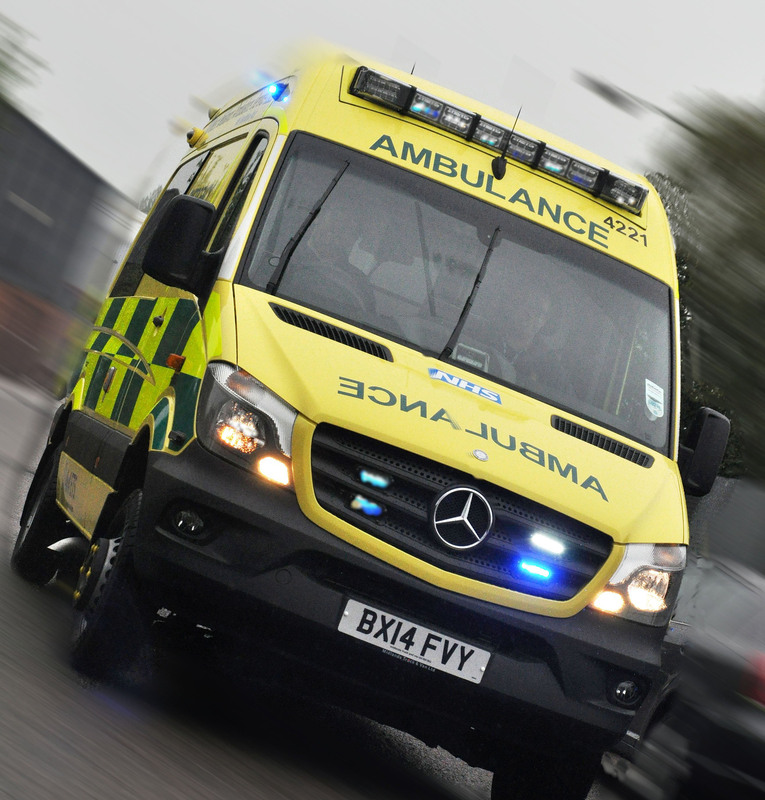 A man has suffered serious injuries after a collision with a car which left him trapped beneath the vehicle in Bedworth. West Midlands Ambulance Service was called to Bowling Green Lane near to a primary school shortly before 4.00pm this afternoon (Thursday). An ambulance, a paramedic area support officer, a critical care paramedic and the Midlands Air Ambulance from Tatenhill were sent to the scene. A West Midlands Ambulance Service spokeswoman said: “When ambulance staff arrived they found an off duty nurse administering excellent first aid to the motorcyclist who, in the impact, had ended up trapped beneath the car along with his motorbike. “The man was very pale and had a reduced level of consciousness upon first assessment by ambulance staff. Working closely with the fire service, who used airbags to lift up the car and stabilise the vehicle, ambulance staff extricated him from beneath the car to carry out a full assessment and start emergency treatment. The road remains closed by the police. Thursday 21st May 2015 – 4.30pm – Jamie Arrowsmith. A woman has been rescued from an Oswestry canal by her family after falling from a lock and subsequently airlifted to one of the region’s major trauma centres. The incident happened at Frankton Locks on the Shropshire Union Canal shortly after 2pm and West Midlands Ambulance Service sent an ambulance, a paramedic area support officer and the Midlands Air Ambulance from Cosford to the scene. A West Midlands Ambulance Service spokesman said: “On arrival, crews discovered a woman, believed to be in her 50s, who was at the canal-side after being rescued from the water by her family. It is believed she had fallen approximately ten feet from the side of the lock and knocked herself unconscious before rolling into the water. “She had regained consciousness by the time crews arrived and was carefully moved away from the edge of the canal with the use of a scoop stretcher in order for a thorough and safe assessment to take place. “She was then treated for a fractured right wrist, cuts to her head and abdominal pain. Pain relief was given and she was immobilised with the use of a scoop stretcher and wrist splint before being airlifted to Royal Stoke University Hospital. Thursday 21st May 2015 – 11.30am – Jamie Arrowsmith. 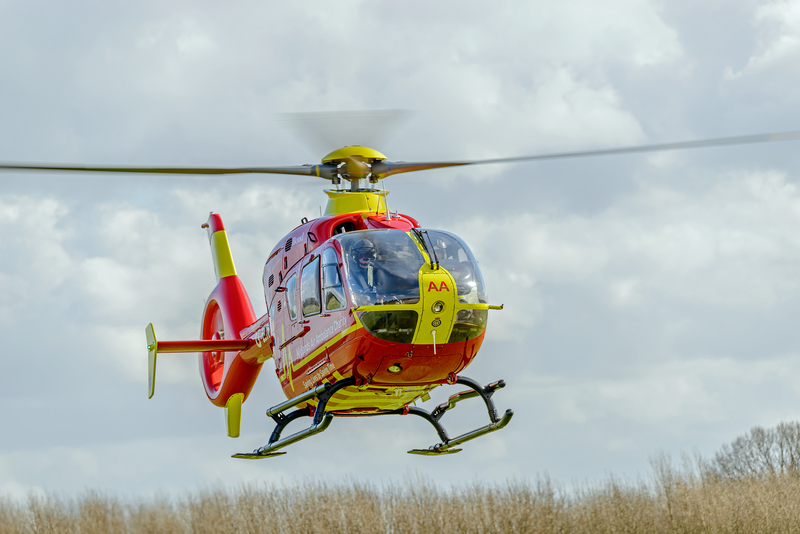 Two people have been airlifted to hospital and a further four taken by land ambulances following a six vehicle collision in Warwickshire this morning. The incident saw three cars, an articulated lorry, a van and a motorbike collide which unfortunately left four of the patients seriously injured. West Midlands Ambulance Service was called to the A46 in Bishopton, outside Cophams Hill Farm, shortly before 8.20am and sent four ambulances, a paramedic area support officer, a paramedic officer, a doctor, the Midlands Air Ambulance from Cosford and the Warwickshire and Northamptonshire Air Ambulance to the scene. A West Midlands Ambulance Service spokesman said: “When ambulance staff arrived they found six vehicles that had been in collision, two of which still had patients trapped inside. “One of the cars had a 66-year-old female and a 62-year-old male driver still inside. It is believed the woman initially lost consciousness in the incident. “Crews worked closely with the fire service to free them both, a process which took approximately 40 minutes. The woman was treated for a serious abdominal injury and given pain relief before being airlifted to University Hospital Coventry and Warwickshire. “The man had suffered a head injury and was also suffering from neck and back pain. He was immobilised with the use of a neck collar and spinal board before being taken to the same hospital by land ambulance. “The motorcyclist, a man in his 30s, had been thrown from his bike in the incident. He was treated for a fractured leg as well as abdominal and pelvic injuries. After having pain relief administered he was airlifted to Queen Elizabeth Hospital Birmingham. “The van driver, a man in his 50s, had managed to free himself from his vehicle and was lying by the side of it. Crews treated him for a fractured right arm before transporting him to University Hospital Coventry and Warwickshire by land ambulance. “Additionally, a woman in her 60s had to be freed from her car and treated for cuts to her head before being taken to the Alexandra Hospital in Redditch whilst the lorry driver, a man in his 50s was taken to Warwick Hospital as a precaution. “A further patient, a woman in her 50s, was assessed and treated for neck pain before being discharged on scene. If used, please credit the pictures to West Midlands Ambulance Service. Wednesday 20th May 2015 – 5.20pm – Jamie Arrowsmith. A man, who has been extremely fortunate to escape serious injury, had to be freed from his car via the boot after it came to rest on its roof on the M40 this afternoon. The incident took place on the southbound carriageway between junctions 12 and 11 shortly after 1.50pm and West Midlands Ambulance Service sent one ambulance and a paramedic area support officer to the scene. The police and fire services were also in attendance. 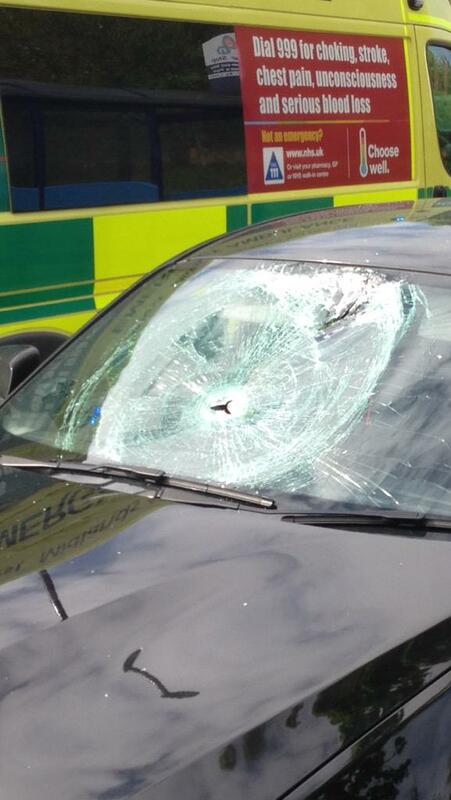 A West Midlands Ambulance Service spokesman said: “Crews arrived to discover a car that had come to rest on its roof. According to bystanders, it had left the road and gone up an embankment, before rolling back down and landing on its roof. “The driver and sole occupant of the car, a man in his 40s, was trapped in the vehicle and crews worked carefully with the fire service to free him through the boot. The highly acclaimed stroke awareness campaigns have already saved over 4,000 people from long term disability according to Public Health England. The Act Fast campaign highlighted the fact that problems with speech and weakness in the face and arms should prompt a 999 call for an ambulance. But what happens after that call has been made? West Midlands Ambulance Service (WMAS) has released two videos to explain how an emergency ambulance response and immediate treatment by clinicians is vital for patients suffering a stroke. A stroke occurs when the blood supply to part of the brain is cut off because of a blockage in a blood vessel or a bleed in the brain. The time lost in getting treatment results in brain lost, meaning that getting immediate medical attention is absolutely vital, often a life-saver. Watch the videos and help reduce the debilitating effects of a stroke. Tuesday 19th May 2015 – 12.10pm – Claire Brown. 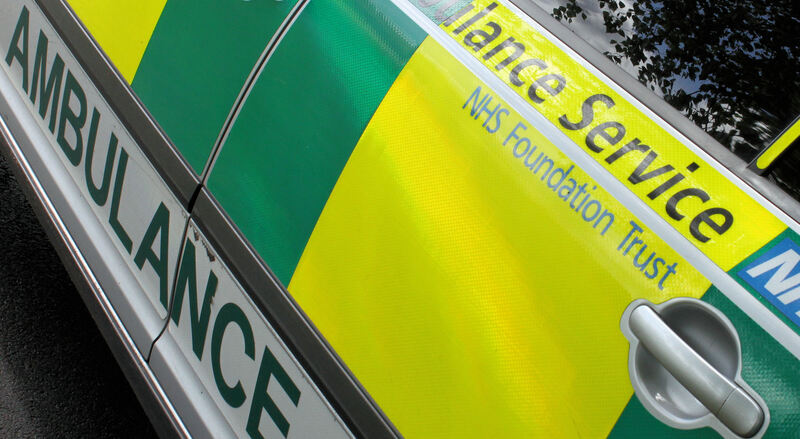 A man was given advanced life support by ambulance staff after suffering a medical episode at the wheel of his car in Wombourne this morning. 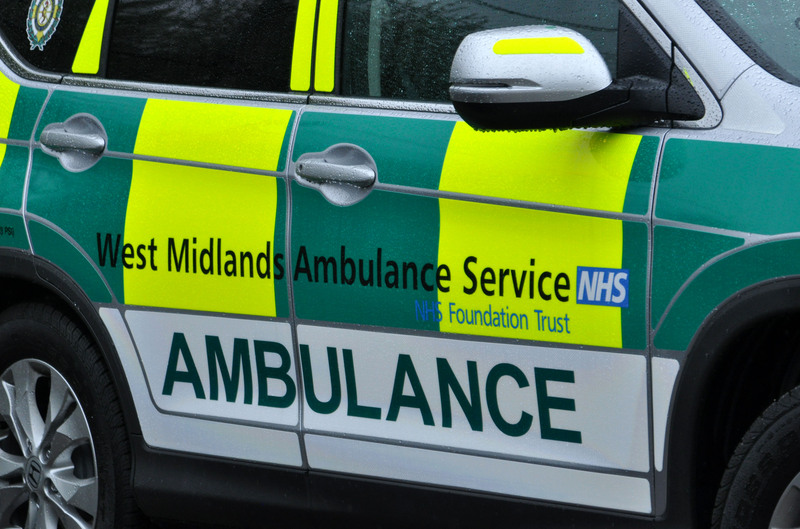 West Midlands Ambulance Service was called to Millfields Way, Wombourne shortly before 9.00am (Tuesday) to reports of a man in cardiac arrest in his car. An ambulance, a community paramedic, a paramedic area support officer and the Midlands Air Ambulance from Cosford with a MERIT trauma doctor on board attended the scene. A West Midlands Ambulance Service spokeswoman said: “When crews arrived they found a car which had collided with a tree. Passers-by were helping the driver, a man in his 60s, who had gone into cardiac arrest. Ambulance staff immediately commenced advanced life support at the scene. Monday 18th May 2015 – 11.20pm – Murray MacGregor. A football fan who had just seen his side win 3-0 has the quick actions of stewards and ambulance staff for giving him the chance to celebrate the win. The middle aged West Bromwich Albion fan had just seen his side beat Premiership Champions Chelsea at home when he suffered a cardiac arrest in the Upper East Stand. Thankfully for him, the staff at the Hawthorns were with him within seconds of his collapse at around 9.25pm, with staff from West Midlands Ambulance Service just minutes later. A West Midlands Ambulance Service spokesman said: “The stewards started cardiopulmonary resuscitation (CPR) which was then backed up by the advanced life support from the ambulance crew. “The man was shocked no fewer than seven times, before being taken on blue lights to Sandwell Hospital. He arrived just 20 minutes after his collapse and was conscious and breathing for himself. “There is no doubt that the quick actions of stewards and ambulance staff has given the fan the best possible chance of survival. “Whilst it is very early days, the fact that he had early CPR and early defibrillation will have increased his chances of surviving considerably. Monday 18th May 2015 – 11.05pm – Murray MacGregor. A teenage driver has suffered potentially serious injuries after the car she was driving collided with a wall and lamppost. 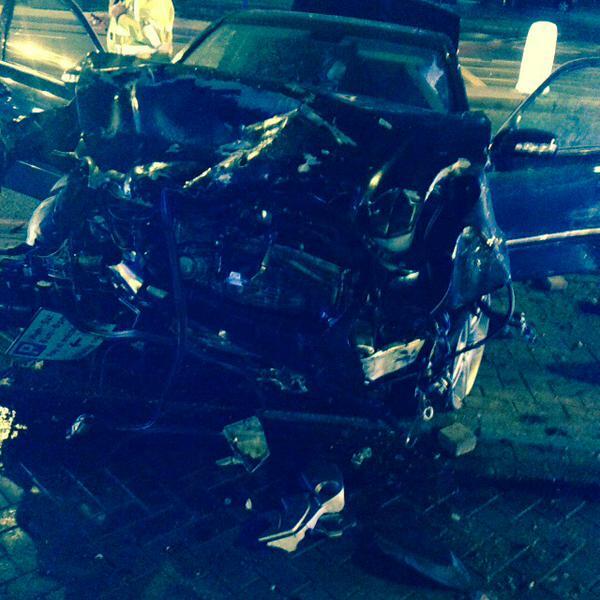 The crash happened at the junction of Enoch Street and Woodbank Road in the Burslem area of Stoke at about 9.15pm. An ambulance and a rapid response vehicle were on scene within five minutes and were backed up by a paramedic area support officer and an emergency doctor from the North Staffordshire BASICS scheme. A West Midlands Ambulance Service spokesman said: “On arrival, crews found a car that had collided with a wall and lamppost causing significant front end damage. The roads were wet. The driver, an 18 year old girl, was trapped by her feet. While ambulance staff treated her, firefighters removed the doors from the vehicle to allow access. Monday 18th May 2015 – 6.25pm – Murray MacGregor. Three people have been injured after a car left the road, went through a wall and collided with a tree. The crash happened at about 11.00am on Comberton Road near the junction with Chester Road in Kidderminster. A rapid response vehicle was on scene within four minutes of the call and was backed up by three ambulances and a paramedic area support officer. A West Midlands Ambulance Service spokesman said: “When crews arrived they found a white Ford Fiesta that had suffered significant damage to the driver’s side; a wheel had come off and the wall and tree were badly affected. “It was not clear exactly what had happened. The front seat passenger, a man in his 40s had to be cut free from the wreckage of the vehicle. Ambulance staff worked on him while firefighters removed the roof. “He was complaining of lower back pain and was immobilised before being taken to Worcestershire Royal Hospital. “The driver, a man in his 60s had managed to get out of the vehicle himself. He was complaining of chest pain, but was otherwise unhurt. He was taken to the Alexandra Hospital in Redditch for further assessment. “The rear seat passenger, a 10 year old boy, was also able to get out of the vehicle himself. He too was complaining of chest pain, but after assessment at the scene, he was taken to Worcestershire Royal Hospital as a precaution. Monday 18th May 2015 – 5.30pm – Chris Kowalik. The woman driver of this car (pictured) has been taken to hospital, having apparently escaped serious injury. 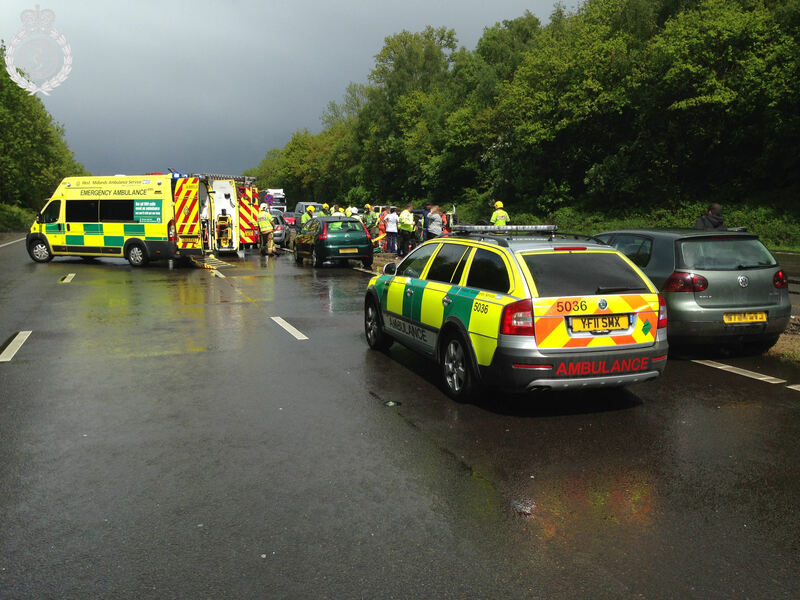 West Midlands Ambulance Service was called to the A449 at Ombersley in Worcestershire at 4pm today. A paramedic area support officer in a rapid response vehicle, a community paramedic in a rapid response vehicle and an ambulance crew attended. 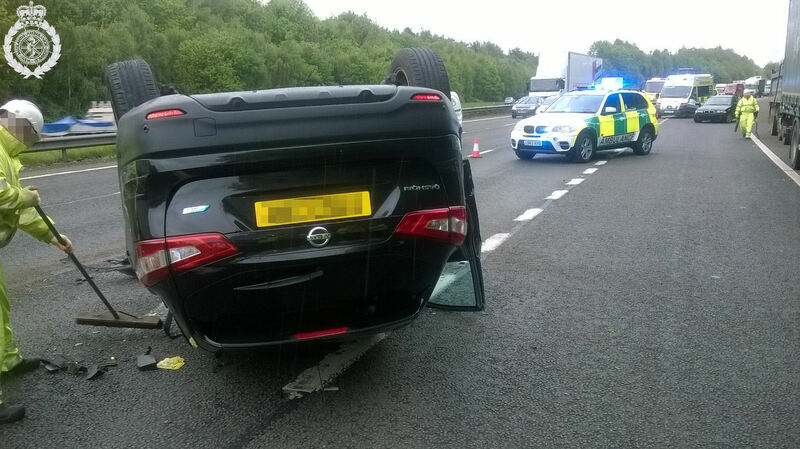 A West Midlands Ambulance Service spokesman said: “The car was upside down. Passersby got the driver, a woman in her forties, out of the car before crews arrived. 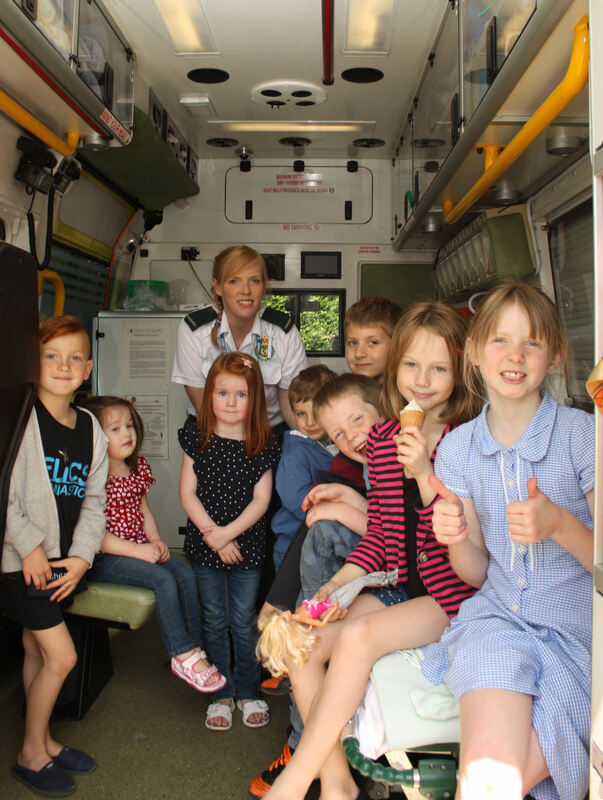 A West Midlands Ambulance Service paramedic spent Saturday showing children at a Worcestershire Primary school around an ambulance. Alison Vinson was at Pitmaston Primary School in Worcester where last year with the help of the Redditch Heartsafe charity she delivered a defibrillator and taught staff how to use it. On Saturday the school held its fete and Alison was there, along with police and the fire service. Monday 18th May 2015 – 4.05pm – Chris Kowalik. 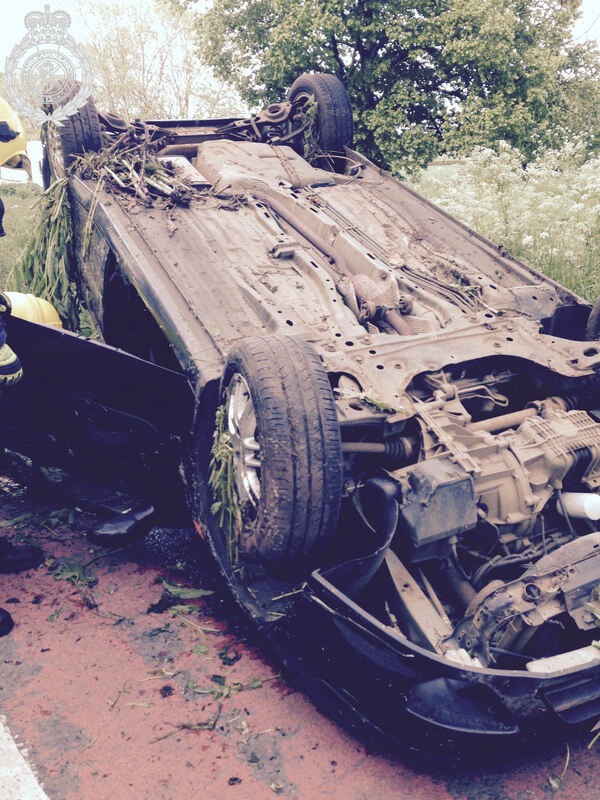 A main road in Warwickshire has been closed after a car overturned. West Midlands Ambulance Service was called to the A46 between Stoneleigh and the Leamington/Kenilworth turning shortly after 2.15pm today. Two ambulance crews, a paramedic area support officer in a rapid response vehicle, a community paramedic in a rapid response vehicle and the Warwickshire and Northamptonshire Air Ambulance attended. A West Midlands Ambulance Service spokesman said: “There were three people in the car, all of whom were taken to University Hospital Coventry and Warwickshire in land ambulances. “A woman who had cuts, bumps and bruises was immobilised with the use of a spinal board and neck collar before being conveyed. A man was also immobilised before being taken to hospital for further assessment. Monday 18th May2015 – 9.30am – Chris Kowalik. Two cardiac arrest sufferers were given a greater chance of survival over the weekend by members of the public who immediately started performing CPR. 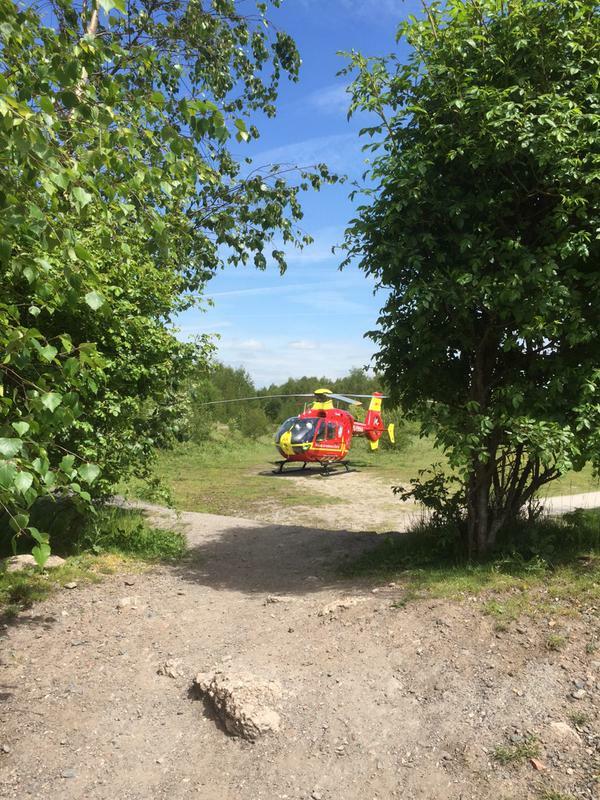 Yesterday morning, a woman in her fifties who was out running with a group in Abbey Hulton in Staffordshire collapsed. Two nurses were running with her at the time and started giving chest compressions. They continued with CPR until the ambulance crew arrived. West Midlands Ambulance Service was called shortly after 10.05am. An ambulance and a paramedic area support officer attended. The woman was taken to Royal Stoke University Hospital. Yesterday afternoon, a woman in her 80s collapsed in the Why Not Inn pub in Halesowen. There at the time was an off-duty midwife. CPR was immediately performed. West Midlands Ambulance Service was called shortly after 1.20pm. An ambulance and a community paramedic attended. Having been resuscitated, the woman was taken to Russells Hall Hospital. A West Midlands Ambulance Service spokesman said: “Although we don’t know of their current conditions at hospitals, we know their resuscitations at the scene were thanks to the immediate help of people who were nearby when these cardiac arrests happened. Their actions prior to the arrival of ambulances greatly increased the victims’ chances of survival. Monday 18th May 2015 – 8.45am – Chris Kowalik. West Midlands Ambulance Service was called shortly after 10.20pm last night. The MERIT trauma team, a paramedic area support officer and two ambulance crews attended. A West Midlands Ambulance Service spokesman said: “Crews arrived at the scene of a two-car collision. “In one car was a woman who had to be cut free with the help of the fire service. She had an abdominal injury and a cut to her head. 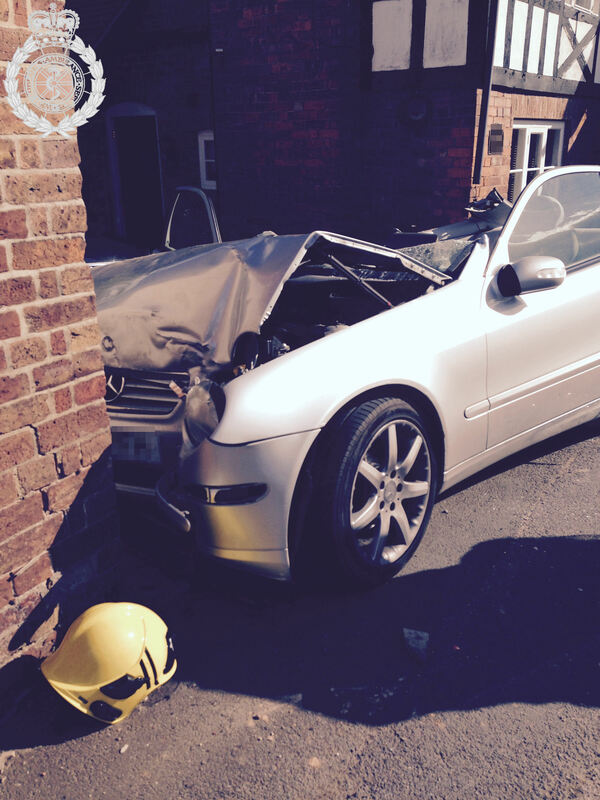 She was immobilised and, accompanied by the MERIT trauma team, was taken to Heartlands Hospital. Monday 18th May 2015 – 8am – Chris Kowalik. 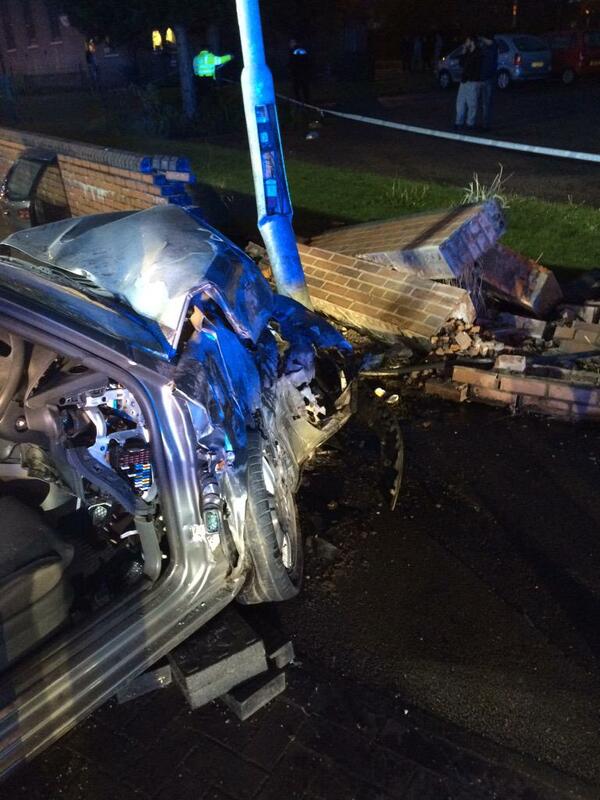 West Midlands Ambulance Service was yesterday called to reports of a road traffic collision in Bilston. Sunday 17th May 2015 – 7pm – Chris Kowalik. A Community Paramedic used his advanced skills to glue a cut to a man’s head at the scene of his car crash. It meant this casualty of the incident in Wellington Road, Bilston, to which West Midlands Ambulance Service was called shortly before 1.25pm today, didn’t have to go to hospital. The advanced Community Paramedic was one of the resources to attend, the others were a paramedic area support officer and two ambulance crews. A West Midlands Ambulance Service spokesman said: “By using these additional skills, we were able to avoid one hospital admission. “Three others did go to hospital though. They were a man with a cut eyelid, a woman with a head injury and another woman complaining of neck pain. Sunday 17th May 2015 – 6.45pm – Chris Kowalik. 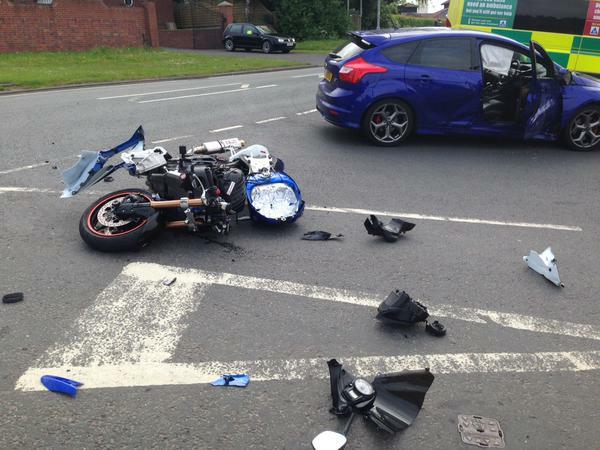 A motorcyclist has been flown to hospital following a collision with a car in Shropshire. West Midlands Ambulance Service was called to Cotwall Lane, High Ercall, shortly before 2.35pm today. An ambulance crew and the Midlands Air Ambulance from Cosford attended. A West Midlands Ambulance Service spokesman said: “The motorcyclist, a man in his sixties, had a fractured pelvis, a fractured wrist and back pain. A pelvic binder was applied, he was immobilised, given pain relief including advanced pain relief to allow the air ambulance crew to remanipulate the fractured wrist and ensure he was comfortably immobilised. He was flown to Royal Stoke University Hospital. Sunday 17th May 2015 – 10.30am – Claire Brown. A man has suffered serious injuries following a collision involving a car and a van in Bordesley Green in the early hours. West Midlands Ambulance Service was called to Landor Street in Bordesley Green shortly before 1.00am this morning (Sunday). An ambulance and a paramedic area support officer attended the scene. A West Midlands Ambulance Service spokeswoman said: “When ambulance staff arrived they found the passenger of the car, a man, half through the smashed windscreen of the car lying on the bonnet. “Upon assessment, he was found to have sustained serious facial injuries and multiple serious fractures to his legs. Ambulance staff quickly worked to stabilise the man by administering pain relief before rapidly extricating him from the car. Friday 15th May 2015 – 10.45am – Steve Parry. Three people have been treated by ambulance crews following a rush hour road traffic collision near Rugeley. West Midlands Ambulance Service was called to the collision on the A51 near Colwich at just after 8.15am. Three ambulances, a paramedic support officer in a rapid response car together with a BASICS doctor and the Midlands Air Ambulance from Cosford were dispatched to the scene. A West Midlands Ambulance Service spokesman said: “Crews responded to a two car collision on the A51 at Colwich this morning. “A female driver, believed to be in her forties, was treated for chest, knee and back pain. “In the second car involved, Crews treated a female driver in her thirties for abdominal injuries. She was initially trapped in her vehicle before being released and immobilised with the use of a neck collar and orthopedic stretcher. “A front seat passenger in his thirties was also trapped in the vehicle and was treated for arm and leg injuries. Thursday 14th May 2015 – 9.20pm – Chris Kowalik. 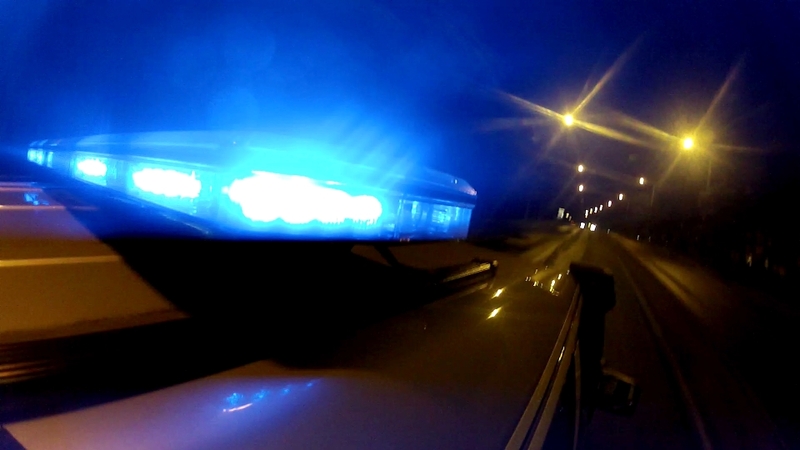 A woman has died after the car she was in collided with a minibus in the Black Country. West Midlands Ambulance Service was called to Park Lane, West Bromwich shortly before 4.35pm today. Two ambulances, two Midlands Air Ambulances, and two rapid response vehicles, one staffed by a paramedic, the other by a paramedic area support officer attended. A West Midlands Ambulance Service spokesman said: “The woman was a passenger in the car. She had serious injuries and all attempts to resuscitate her were unsuccessful. Sadly she was confirmed dead at the scene. “A man who was the car’s driver, was a ‘walking wounded’ casualty who was taken to Sandwell Hospital. A Nepali woman seriously injured by falling debris in Tuesday’s earthquake was airlifted to a Kathmandu hospital on Thursday in the prime minister’s helicopter, after two West Midlands Ambulance Service paramedics pleaded with officials to help save her life. Phil Llewellyn and Ed Hullah are spending their annual leave in Nepal helping with the humanitarian rescue. Thursday 14th May 2015 – 12.55pm – Chris Kowalik. One lane was blocked on the M40 in Warwickshire this morning after a two-car collision with in one car ending up on its roof. 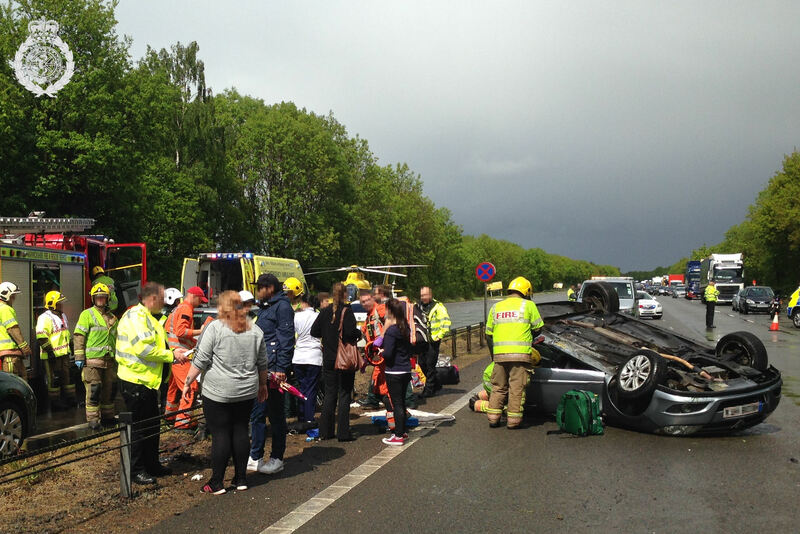 West Midlands Ambulance Service was at the scene to help, on the northbound carriageway between junctions 14 and 15. The service was called shortly before 9.45am today. A community paramedic, a paramedic area support officer and an ambulance crew attended. 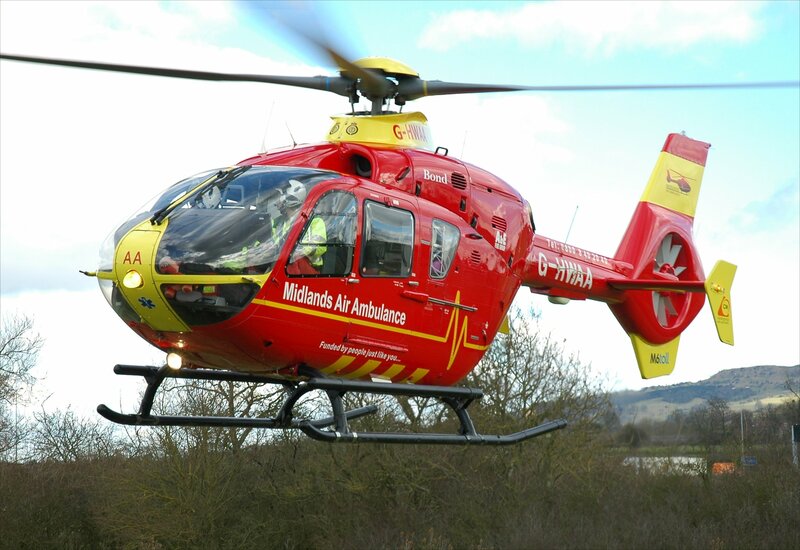 A Midlands Air Ambulance has flown an injured motorcyclist to a major trauma centre after a road traffic collision in Wolverhampton. West Midlands Ambulance Service was called to Spring Road, Ettinghsall shortly after 2.20pm today. In addition to the helicopter, a land ambulance, a community paramedic and a paramedic area support officer were sent to the scene. A West Midlands Ambulance Service spokesman said: “Crews attended an incident involving a car and motorcycle at about 2.20pm. “The motorcyclist, a man in his twenties, had bruising to his chest and had suffered a seizure. The patient was immobilised and a SAM splint was applied. Wednesday 13th May 2015 – 5.45pm – Chris Kowalik. A passerby who witnessed West Midlands Ambulance Service’s handling of a car crash in Worcestershire today, approached the incident officer to tell him how reassured he was by what he saw. The ambulance service had been called shortly before 3.45pm today to the A38 in Severn Stoke where a car containing three people had collided with two buildings. Three land ambulances attended, overseen by a paramedic area support officer. A West Midlands Ambulance Service spokesman said: “No-one in either building was injured, but there were three casualties in the car. “A woman front-seat passenger who is in her eighties had a fractured ankle and a fractured wrist. She was given pain relief at the scene, was immobilised with the use of a scoop stretcher and neck collar and was taken to Queen Elizabeth Hospital Birmingham. “A man in his fifties who was a rear seat passenger had a chest injury. He was taken to Worcestershire Royal Hospital. “The driver, a man in his 80s, had tenderness in his back. With the help of the fire service, he was cut free from the car. He was immobilised on a scoop stretcher and a neck collar was applied. He was taken to Worcestershire Royal Hospital. Wednesday 13th May 2015 – 12.10pm – Chris Kowalik. A man walking his dog has been flown to hospital after being trampled by a herd of cows. 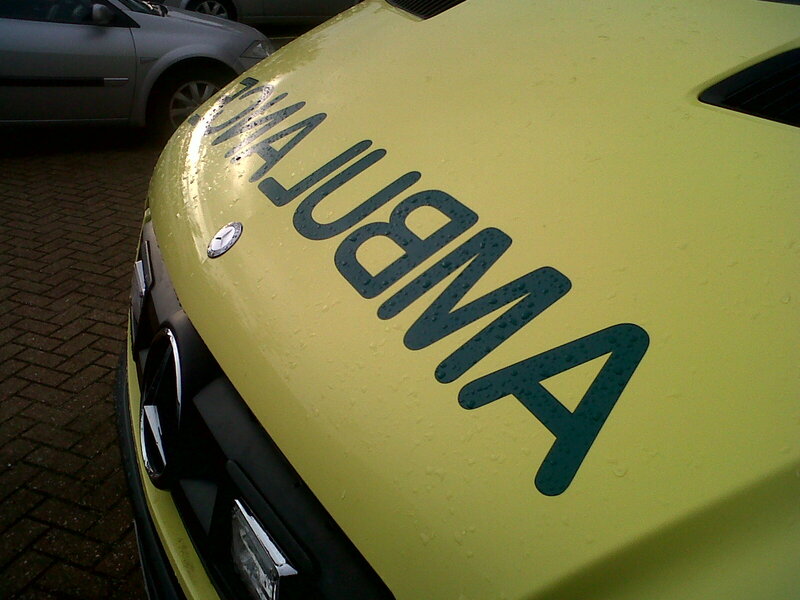 West Midlands Ambulance Service was called to the disused Kenilworth railway line in Balsall Common at 8.10am today. A paramedic in a rapid response vehicle, an ambulance crew and the Midlands Air Ambulances from Cosford in Shropshire and Strensham in Worcestershire attended. Wednesday 13th May 2015 – 11am – Chris Kowalik. A teenager has been injured after a collision with a car in Coventry that left the windscreen shattered. West Midlands Ambulance Service was called to Westwood Business Park shortly before 8.50am today. The control room received numerous calls reporting a collision involving a car and a pedestrian. An ambulance crew, a paramedic area support officer in a rapid response vehicle and the Midlands Air Ambulance from Strensham in Worcestershire attended. Three fire stations in Birmingham now have life-saving devices thanks to West Midlands Ambulance Service. 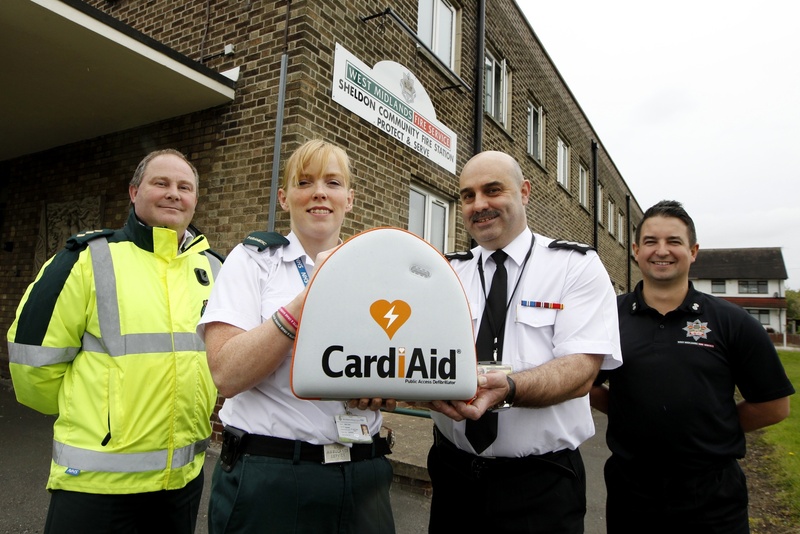 Sheldon, Erdington and Bournbrook stations have received the devices from West Midlands Ambulance Service. 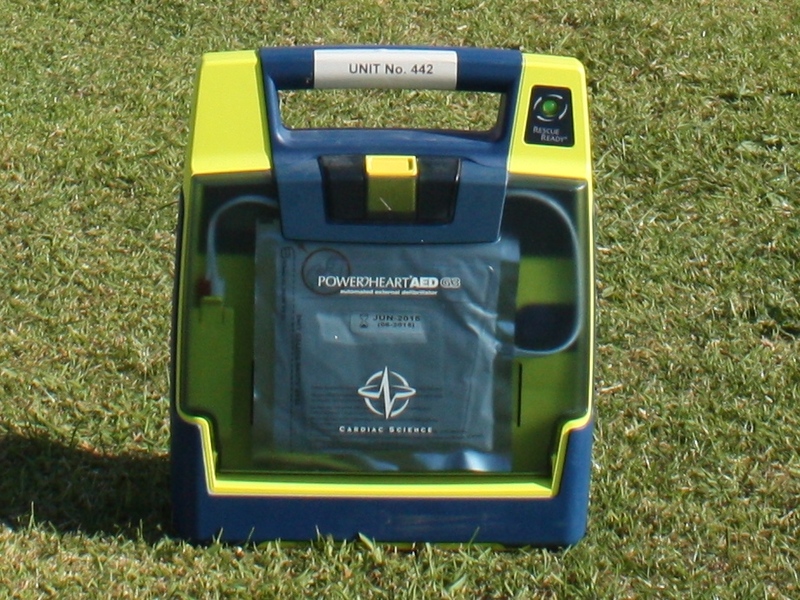 An Automated External Defibrillator (AED) can be used to help restart someone’s heart following a cardiac arrest. Pictured: Andy Jeynes and Ali Vinson of WMAS hand over one of the AEDs at Sheldon fire station to Station Commander Andy Smith and Watch Commander Nathan Highfield. Tuesday 12th May 2015 – 3.05pm – Steve Parry. 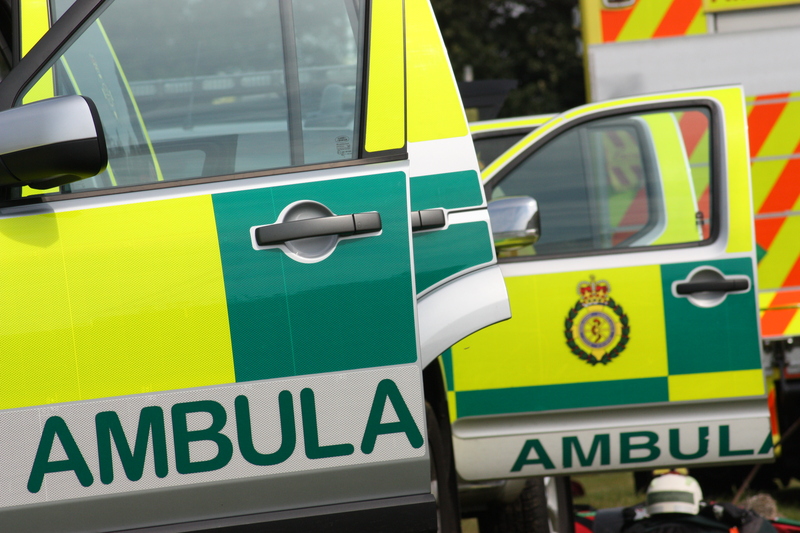 A man has died in a single vehicle road traffic collision in Shrewsbury this morning. West Midlands Ambulance Service was called to Telford Way at just after 11.15am. 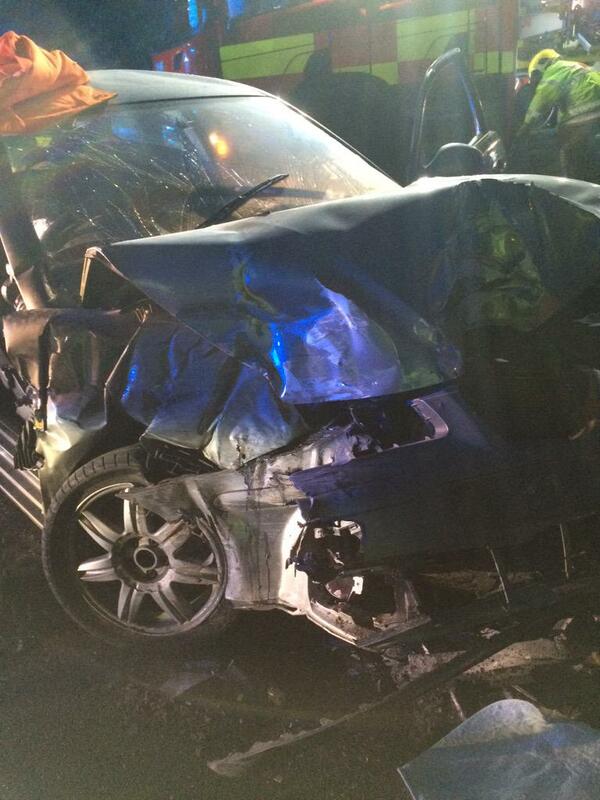 A West Midlands Ambulance Service spokesman said: “Crews attended a road traffic collision on Telford Way. When they arrived, they found an off duty paramedic and nurse performing CPR on the elderly driver. 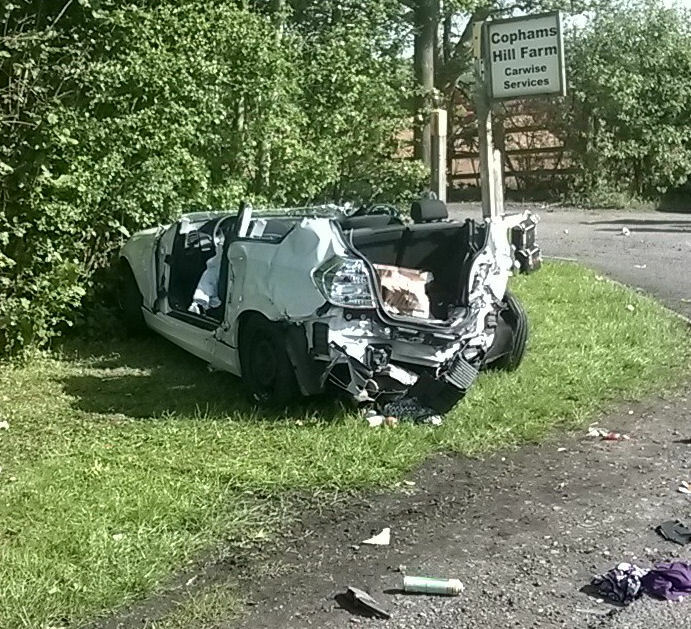 They were told the car had left the road and collided with a hedge at low speed.